Well, yesterday I actually got to stamp more than I have in weeks! I made this card first and have 2 more well on their way. I hope to finish them today before the MFT Release party for ya'll! Anyway, this is Day 5 of "teasers" from My Favorite Things for this month's HUGE release. Tons of new stamps, ribbons, felt, cork and DIES!! It just gets better and better, huh?! 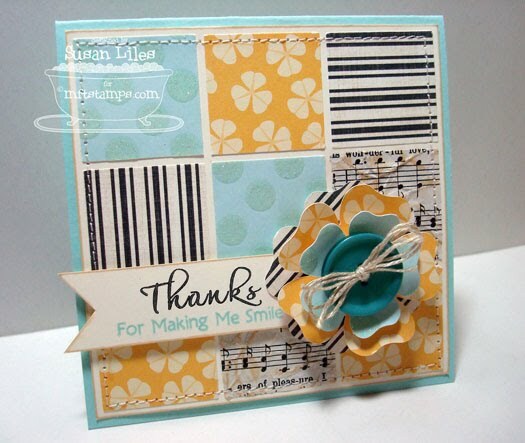 This set is called Thanks a Bunch and features a few simple "thanks" stamps that coordinate with several "add-on" sentiments that are included to complete your thoughts exactly. For this card, I borrowed the sketch from Taylor's challenge and picked some fun paper that doesn't necessarily match (I think that's one of my favorite things to do! 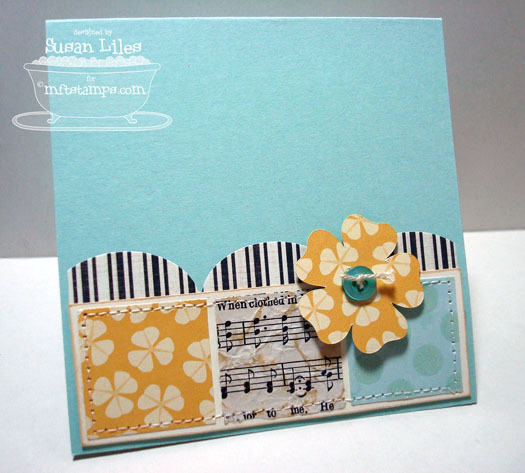 ), but it "goes together" for a fun shabby-chic look (hi Sara). I cut the flower out with my Slice machine in two different sizes and popped up each layer to make it really stand out and topped it all off with a big ol' MFT button. Wouldn't it be great to get this set for FREEEE? (Whenever I say that, I have to say it like Adam Sandler did in the movie "Bedtime Stories"!) Any time is a great time to shop MFT! Our Triple Scoop program rewards you every day! Simply purchase 3 full sized sets ($15.95 or higher) and receive a FREE set from MFT. After you’ve added your 3 set choices to your cart, click the Triple Scoop “add to cart” button to receive your free set. You can always purchase the Triple Scoop Promo set at it’s normal price as well, but free is always better, right?! This Thanks a Bunch set is the Triple Scoop set for May. Yay! Want to see more? Surf on over to Kim's blog after 11am EST for a full list of DT members who have more teasers for ya'll today. THEN, don't forget to join us tonight in the MFT forum on SCS right HERE for the release party. The fun starts at 8pm EST. The sets will go "live" for ordering at 10pm on the MFT website. 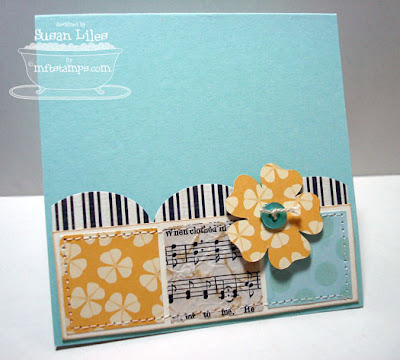 SUSIE Q-TIP: Scared of putting patterned papers together? Find a simple layout like this one that emphasizes a sentiment only and go to town. For more paper. And then make a card. This is beautiful! I love the colors!!! I LOVE this card! The colors and textures are simply amazing!!!! This is really awesome, love the music paper you added! Love, love, love it, Sus! The colors are abso-stinkin-lutely fantastic! I love this!! lovely! all the papers are gorgeous and i love the large scallop & the flowers!! can't wait to see your other projects! LOVE that dp GF!! What a wonderful card!! Stunning, Susan, just stunning!! Paper choices are perfection! 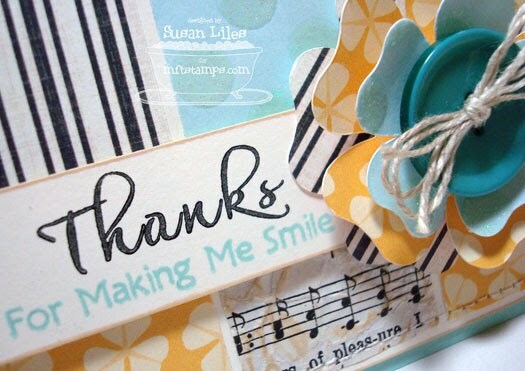 LOVE this paper combo, Susan!!! Real fun and unexpected! !